The female swan flies from the sky and stand on top of the male swan. This is the Mon belief that the main character, “King Tabin” really respects. 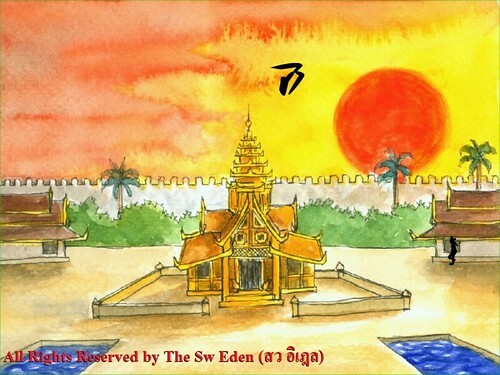 During the great flood, there was the only land left in Myanmar, and the male swan found that land as the first person, so he flies down and stand on it. The female swan came slower than the male swan, so the male swan allowed her to stand on top of him. This belief is the main reason that King Tabin is the gentleman for the women, but that does not mean he is the gentleman to the men. 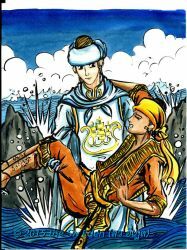 In the project “Save Nanda Bayin”, we can notice in the first shot, that King Tabin does not care what his brother in law says, but he goes to help the child just because his sister commands him. Let’s come back to talk about the main page. 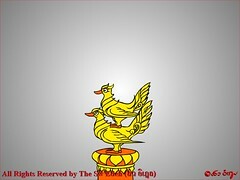 After you finish load the main page, the couple swan will move the your left hand side, and you will see the small palace which the child, “Nanda Bayin” lives in. You can see the red giant sun, because this time is the morning. After the user click “Play Now”, the camera will move into the door, and it brings you to the first intro shot. 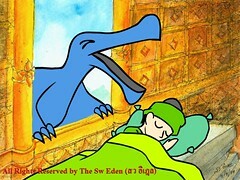 The giant flying dinosaur, Anhanguera comes at the window and takes the child to feed its babies. 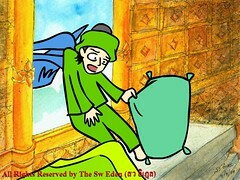 As he is the child, he pulls his pillow with him, but he drops it outside his palace. That pillow falls on King Tabin, the main character. 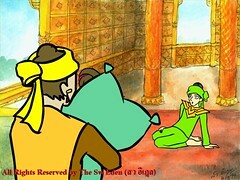 King Tabin holds that pillow with him, and comes into the palace. He sees his sister and his sister’s boyfriend are crying, so they talks. “Hey guys, I found this pillow outside,” King Tabin says. “Shut up, you steal him, didn’t you?” the brother in law guesses, because King Tabin had stolen his child once. “Hey bro, this time I didn’t,” King Tabin refuses. “Crazy! 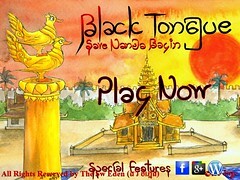 You go get my baby now!” King Tabin’s sister gets angry after King Tabin said that. “Alright, I do it,” King Tabin is in the shrug emotion.